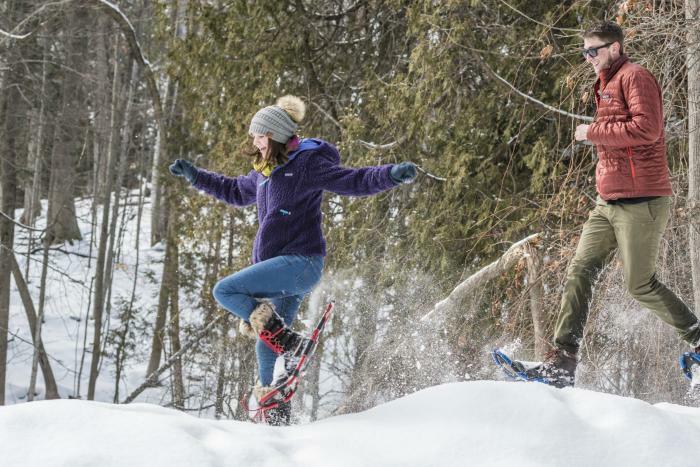 It’s beautiful winter weather this year -- wonderful weather for a few hours of Nordic skiing or snowshoeing on some of the Traverse City area’s many lovely trails. But since we’ve got hundreds of miles of trails to choose from, maybe we should make a good thing even better by pointing out where snowshoes can be used without causing problems for cross-country skiers. Snowshoes are a wonderful way to get around in the wintertime; they’re simple, convenient and easy to use. However, they’re not always appropriate on ski trails. Not only can they quickly ruin a groomed ski trail like the Vasa Trail or the Muncie Lakes Pathway -- even when you’re trying to be a good citizen -- but they really work better on a different kind of terrain. Those long slopes so prized by skiers are no big deal to a snowshoer, but he can scramble easily around corners and rough spots where skiers dare not go. Here, thanks to some great advice from John Heiam of the Grand Traverse Hiking Club, is a short list of trails that are especially suited to snowshoes and their unique features. The steep hills that lie just west of Munson Medical Center and the Village at Grand Traverse Commons contain almost five miles of winding trails that are really much better suited for snowshoes rather than skis. There are some awesome views of the city from the summit, and the trail system is so heavily used that the snow gets packed down into a convenient path. It’s even a good place for an after-dark outing! Another great trail system near the city limits is this one at the southern end of the Old Mission Peninsula, just off Center Road. Technically, it’s open to both skiers and snowshoers, but the terrain lends itself much more to snowshoes than to skis. The 62-acre park features almost three miles of looping trails that pass from an upland meadow, down a steep forest of red and white pine into more meadows and woods, then into a rare grove of mature hemlocks that’s truly magical when dusted with fresh snow. Within this 500-acre nature preserve along the Boardman River, just upstream from South Airport Road, there are at least seven different wildlife habitats, from swamp and pine forest to upland meadow -- a great place to watch for small creatures and waterfowl. There are several places to access the seven-mile trail system, which includes bridges, lookouts and the ruins of a former dam. Forty years ago, when locals wanted to try out their cross-country skis (almost nobody had snowshoes then) this was THE place to go. It was downright crowded, in spite of its remote location off Broomhead Road, and a Saturday trip to Sand Lakes was a regular feature of Traverse City winters. Nowadays, there are groomed ski trails much closer to town, so there’s room enough at the 2,800-acre Quiet Area for skiers and snowshoers to coexist -- usually on their own parallel trails. Almost eight miles of trails are maintained (but NOT groomed) in winter, and everything is well-marked. I took this hike on John’s advice, and it wasn’t an easy place to find -- tucked away along Scharmen Road just east of the Brown Bridge Natural Area -- but it’s the perfect place for a snowshoe hike. Deep in a very steep-sided valley along 22 Creek, there’s a rare bit of old-growth forest. The terrain was too steep to make it worth logging, and so damp that it escaped the wildfires that destroyed most of our woods a century ago. Some of the trees here are as big as 40 inches in diameter and many are well over 100 feet tall. An awesome place, but don’t go by yourself if you get lost easily! 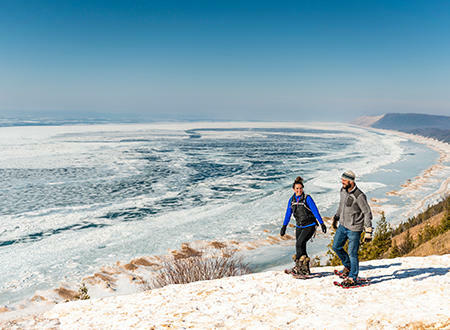 Of all the trails at the Sleeping Bear Dunes National Lakeshore, this one is best suited for snowshoeing, especially for inexperienced hikers. It’s relatively short -- a mile and a half through a lovely hardwood forest -- and it’s got a great payoff in the form of an amazing view of Lake Michigan, Sleeping Bear Point and the Manitou Islands from a platform 400 feet above the water. If the hike to Empire Bluff has whetted your appetite for a more spectacular Lake Michigan vista, try this more challenging ascent just south of Leland. Distance-wise, it’s only slightly longer than the Empire Bluff Trail and a little less lofty -- but you climb to the 300-foot-high crest of the trail pretty much from ground level. It’s a beautiful spot -- with another splendid viewing platform overlooking the Lake -- and a great workout. There! That’s enough for one winter. Enjoy the trails -- and always remember to be considerate of the people who share them with you.